One of the most enthusiastic yachtsmen of the Clyde. He com­menced his yacht-racing career in 1886 with the 3-tonner Ariel, followed by the 10-raters Yvonne in 1889 and Yseult in 1892. In 1893 he became head of the syndicate which built Callum, and acted as representative owner during the season when she raced against Britannia, Valkyrie II., Satanita, Navahoe, and Iverna. 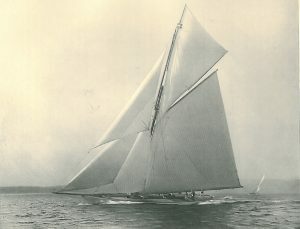 In 1895 he built and raced Isolde, 65-footer, a phenomenally successful boat, which brought him into the front rank of racing owners. After selling Isolde in 1901, he built Yvalda to the Clyde one-design 20-ton class. Bona. Built in 1897 for Mr. Peter Donaldson. In 1902 he bought Bona, and raced her for three years, and still owns her. With her he attained enormous success, winning three Queen’s Cups in one season, and nearly always defeating Meteor II. when cutter-rigged. He is a member of the Council of the Yacht Racing Association, and takes an active interest in its affairs. He has acted as Flag Officer for the Royal Northern, Royal Clyde, and Mudhook Yacht Clubs. Clubs: Royal Northern, Royal Clyde, Royal Highland, Royal Thames, Mudhook, and Clyde Corinthian. Address; 7, Royal Bank Place, Glasgow.